I started this blog while looking for cousins who share my love of family history. It’s been really fun connecting with kindred spirits and meeting extended family. Love love love collaborating with cousins who are equally inspired. But family history is only one of my interests. There’s also photography, old newspapers, graving, exploring technology, travel and so much more. They all tie together in one way or another which is good ’cause I get bored doing just one thing. When planning for this new year, I wondered how I would keep a blog about many things from becoming cumbersome or confusing. and a never-ending quest organize my stuff. I went through both lists to see which interest(s) could be addressed by which blog prompt(s). It seemed to work out very well! Then I composed a 2016 one-page-per-month Excel calendar and started plotting dates, asking myself reality-check questions along the way. What information would I include in each of the theme posts? How long would each post take to research and/or write? How many of each could I reasonably expect to complete each month? Consistently? Was I leaving enough space for the occasional spontaneous post? Adding holidays and family birthdays meant deciding whether to add posts or replace themed posts that may have fallen on those dates. When the monthly strategizing was done, I made an at-a-glance spreadsheet showing my topics and dates for the year. As individual posts began to take shape, I added comments to the appropriate cells. Once the post was scheduled, I highlighted it in green. I should tell you that I did all of this in early December. I started drafting this month’s posts weeks in advance, using my handy-dandy new plan. I can’t believe how much easier blogging has become! Now I don’t want you to get the wrong idea. 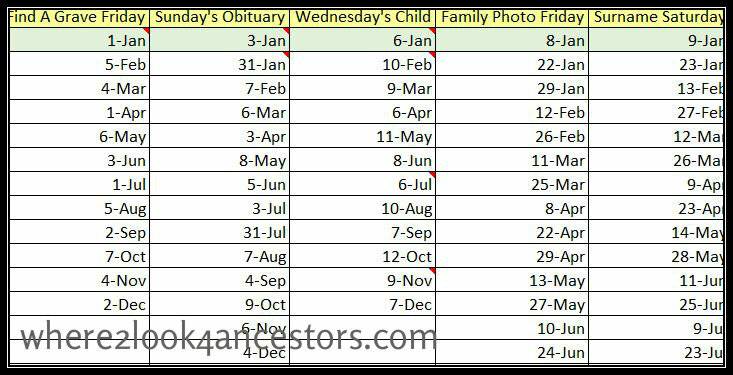 I had a plan last year too, but it was based on a calendar created by Family Tree Maker. 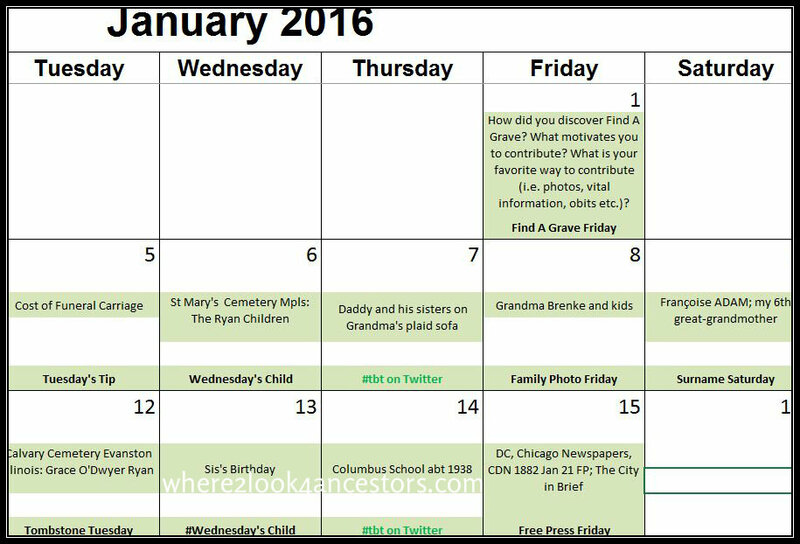 I felt pressured to add new tidbits about ancestors who may or may not have been on my current research radar. More importantly, that calendar didn’t address the “many things” listed above – things I wanted to do and things I wanted share. So how, you may ask, has this simple task changed my life? The biggest impact has been that blogging became so enjoyable! All the topics about which I want to share are now neatly arranged on a calendar page. Some posts practically write themselves now. Posts that require research focus on topics I want to research. I’m able to accomplish tons more in a 30 minute session than ever before. And quite unexpectedly, I feel like I have more flexibility, more freedom as it were, to write about things near and dear to me. Which is weird (isn’t it?) since everything appears so structured. Of course, the proof is in the pudding. Will I be able to follow the plan consistently? Super fun Jana – thanks! OMG!!! You take organization to a whole new level!!! I am green with envy.